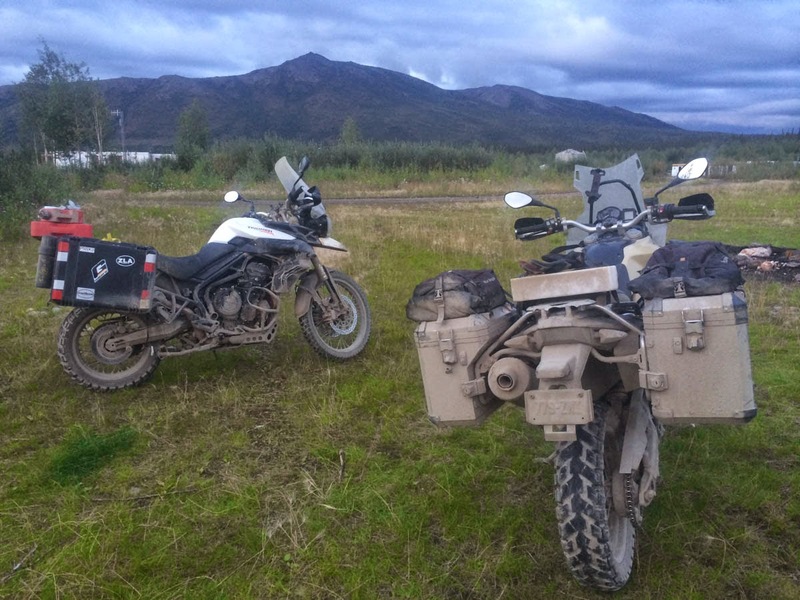 We bookended our trip up the Dalton Highway between stops in Fairbanks. On our way up we decided to take a breather and see what could be done with my bouncing front tire and what the city might have in the way of decent beer. For the first problem we stopped by Adventure Cycleworks, as recommended by the ADVrider website. Up a winding unpaved suburban street and around a few potholes we found Dan, the garage’s affable owner. With his long hair, beard and wireframe spectacles Dan looks every inch the biker. 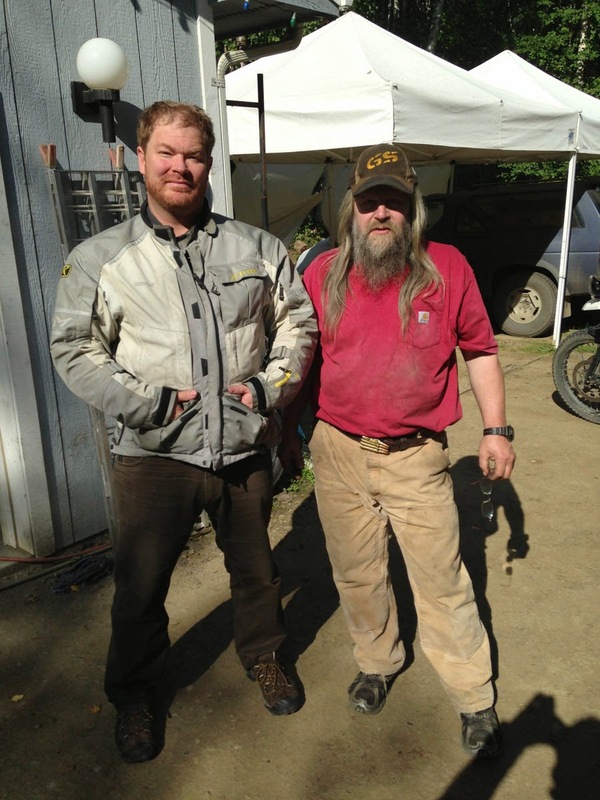 As he set to working and chatting it soon became clear that his shop was the first and last outpost for dozens of motorcycle adventurers heading up to Prudhoe Bay. He’s seen them all, from over-equipped middle aged guys out on their ‘find themselves’ tour to boy racers ready to smear their bikes into a rogue moose at high speed. Watching Dan work was a pleasure. As a skilled technician his is clearly a labor of love. All his most commonly used tools were within arms reach. Without a wasted movement he had my front tire off its rim and the replacement seated and balanced in 30 minutes. While he worked, he gave us some history of the area, the Alaska pipeline, and what to watch out for on the road north. “Ground squirrels. Little bastards will knock you right off your bike if you’re not careful. You can’t miss ‘em, they stand by the side of the road and won’t move. Just straight leg them out of the way.” It’s not an easy thing to admit, but I almost looked forward to a little squirrel polo. Finding decent beer proved no hardship, either. The Midnight Mine was appropriately dark and smokey, but served a variety of local brews and free burgers. Fairbanks looks a little down at heels in the summer, like someone took off it’s shirt only to reveal a bad case of impetigo. We were happy to be leaving in the morning. The round trip from Fairbanks to Prudhoe Bay is roughly 1,000 miles. That figure is a little mind-boggling written down, if only because the distance looks so small on the map. Such is Alaska. My new tire scrubbed in on the first 100 miles of the trip and things seemed to be going fine until just outside Coldfoot when Sledge pulled over to adjust his chain. Together we looked it over and checked the tension and all seemed to be in its proper place. Then Sledge had to do the same thing again near Deadhorse when the chain worked itself loose for the second time. Finally, on the north side of the Atigun Pass Sledge lost his patience with the slapping chain completely. In short he order adjusted the tension, test rode Verity around the lay-by, dumped her, picked her up, kicked her, then readjusted the chain a second time. Watching other people behave the way that I would in their situation is, for me, the essence of comedy. It was all I could do to keep from laughing out loud. Given Sledge’s dark mood, not to mention his sheer size, I contained myself and even resisted the urge to video the whole scene. Back in Fairbanks after just four days we returned to Dan’s garage and Sledge explained the problem. “Want a new chain?“, Dan asked. “Should get some sprockets, too.” “If that will fix it, absolutely!”, Sledge replied with quiet determination. An hour later Verity had become in Sledge’s words “a new bike.” With that the clouds parted and cleared the way for blue skies and open roads.